Sophie and Dad were cooking along nicely until Dad announced he was going to add a new ingredient to the family recipe. He was going to marry Maggie! When asked to be the flower girl, Sophie heard, “Flour Girl!” Now Flour Girl is determined to spoil everything. Available as an interactive app/game for tablets/phones from TINY TAP (requires Tiny Tap app) Read by the author! A Mom’s Choice Awards Recipient! 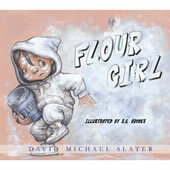 FLOUR GIRL has been awarded a Silver Medal in the 2008 Mom’s Choice Awards! The Mom’s Choice Awards® honors excellence in family-friendly media, products and services. An esteemed panel of judges includes education, media and other experts as well as parents, children, librarians, performing artists, producers, medical and business professionals, authors, scientists and others. A sampling of the panel members includes: Dr. Twila C. Liggett, Ten-time Emmy-winner, professor and founder of Reading Rainbow; Julie Aigner-Clark, Creator of Baby Einstein and The Safe Side Project; Jodee Blanco, New York Times Best-Selling Author; LeAnn Thieman, Motivational speaker and coauthor of seven Chicken Soup For The Soul books; Tara Paterson, Certified Parent Coach, and founder of The Just For Mom Foundation(tm) and the Mom’s Choice Awards®. Parents and educators look for the Mom’s Choice Awards® seal in selecting quality materials and products for children and families. This book has been honored by this distinguished award. Clink on the link to hear a Podcast interview about Flower Girl!